The start of this week was a little slow — rainy days and our whole family battling colds. I was so excited to wake up this morning to see the sun shining and everyone feeling a little better. 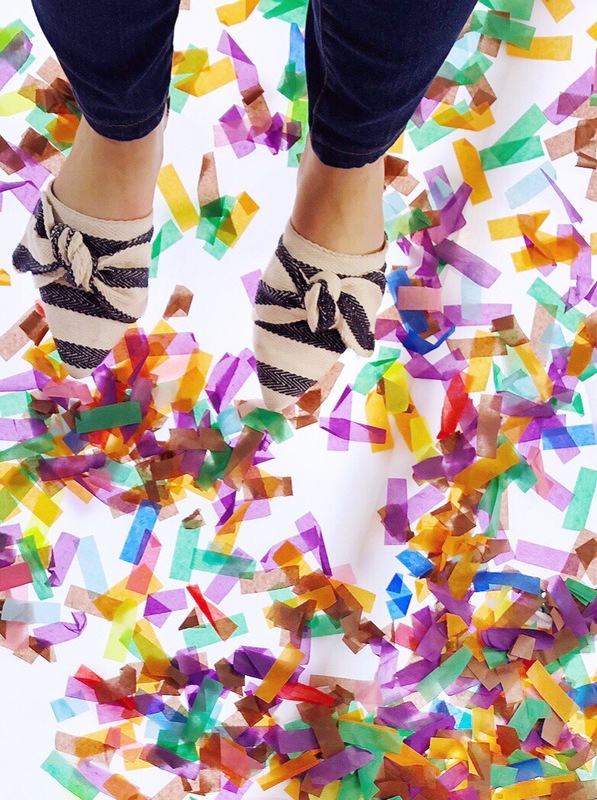 Nothing puts a spring in my step like actual springtime (and jumping in confetti, like we did at The Happy Place in Boston last week!). Sharing lots of spring-y finds, Easter ideas, fresh seasonal recipes and more in The Download this week, read on and enjoy the sunshine! New Recipes. I’ve been all about the easy, meal-prep recipes this month and shared a Trader Joe’s hack for Spicy Peanut Noodle Salad, wrote a giant review of the pros and cons of my Instant Pot (and some of our favorite Instant Pot recipes! ), and I spilled the beans on my favorite lunch recipe lately: Tarragon Curry Chicken Salad. If you’re looking for entertaining recipes I also shared an easy Sushi Night themed party, and a quick recipe for Roasted Asparagus with Creamy Dijon Sauce that’s perfect for Easter dinner! Easter Ideas. I’ve had so much fun with my Easter content this year, and can’t wait to celebrate – I think Jane will love the local Easter egg hunt! If you’re looking for some inspiration check out my Easter Basket ideas round up (the favorites have been the play doh eggs and bunny sunglasses! ), an easy kids table Easter meal idea, tips for toddler Easter egg decorating, and my tricks for a beautiful Easter grazing board! And if you’re looking for an easy to prep holiday dinner, I shared a simple Easter menu this week too. Reading List. I’m midway through Where the Crawdads Sing and since this book has been SO hyped up, I keep waiting to get really sucked into it and it just hasn’t clicked for me yet — I have some progress to make it on it tonight! I also have Gretchen Rubin’s new book on my nightstand and I just started flipping through it, I love her writing and will report back on Outer Order, Inner Calm (her book, Better than Before is one of my all-time favorites). A few new non-fiction books in my stack: Erin Gate’s Elements of Family Style, which is so beautiful and full of thoughtfully designed family-friendly spaces; and Icing on the Cake, a cookbook dedicated to the art of cakes and oh man it makes me hungry and wish I was a better baker!! Book Events. Join me for a fun kid-friendly Easter event at Petit Peony in Duxbury, MA this Saturday (4/13) from 10am-12pm where I’ll be signing books and kids can decorate Easter cookies (with a shortbread recipe from my book!). To RSVP for the event, send an email to [email protected] I’ll also be Warren, RI at Inkfish Books on Sunday, June 2nd from 1-3 – save the date and come say hi if you’re local! Favorite Things. I’m going nuts for the new Opalhouse pieces at Target – the tiny bar cart and this side table are oh-em-gee-cute! I’ve also had my eye a rattan bag at Target, keeping in the natural theme. If you’re looking to refresh your basic t-shirts for spring, check out these pocket tees from the Universal Thread line – I’ve bought one in every color after seeing how nicely they wash and fit (and at $8, super affordable too). My other new spring obsession: Rothy’s shoes. I finally got a pair of the loafers after hearing so much hype and they are life-changing comfortable.I’m already plotting my next pair (their new colors are right up my alley)! Quick-Prep Easter Dinner Menu. Tortellini with Peas and Leeks.